Large commercial trucks have the potential to cause and/or contribute to devastating motor vehicle accidents. This is in part due to their large size. Not only are fully-loaded trucks significantly taller than passenger vehicles, but they can weigh twenty to thirty times more than a passenger vehicle. The large size of a truck can affect the ability of the truck to stop suddenly in the event of a traffic incident, particularly if a truck driver is nodding off due to long hours on the road. The truck driver either falls asleep at the wheel, is incapacitated by health emergency such as a seizure or heart attack, or is otherwise physically impaired. While a seizure or heart attack is unpredictable, fatigued drivers are actually regulated. The Federal Motor Carrier Safety Regulations limit the number of hours a truck driver can be on-duty and on the road without breaks. The truck driver is inattentive, is distracted by something either outside or inside the truck, such as a phone call or a text message, or fails to observe a situation adequately for another reason. The truck driver is drives too fast for conditions, misjudges the speed of other vehicles, or follows other vehicles too closely. According to the truck crash causation study, truck drivers can also exceed the speed limit simply because they feel the pressure from their employers to get as much driving done within the regulated window. To drive a commercial truck, the driver must be 21 years old, know enough English to read and understand traffic signs, have a valid commercial driver’s license, and successfully complete a driver’s road test. Truck drivers who do not meet these qualifications can be unaware of adverse conditions, particularly if they are novices or cannot speak English. The truck driver either panics, overcompensates steering, or exercises poor directional control. A truck driver cannot have any detectable amount of alcohol or drugs in their system while driving a truck, while on duty, or any time they are in physical control of a truck. According to the truck crash causation study, over the counter drug use, illegal drug use, or alcohol use was a cause in twenty percent of large truck accidents. A truck driver must inspect their equipment and make sure it is in good working order at all times. Federal regulations require that a commercial truck cannot be driven unless the driver is satisfied that the mechanics, including brakes, lights, and wipers, are in good working condition. Brake problems were a causative factor in twenty-nine percent of all truck accidents between April 2001 and December 2003. Truck drivers also need to inspect the loads they are hauling. Both truck drivers and their employers should make sure that the load is properly distributed and adequately secured. Four percent of all truck accidents are caused by a cargo shift. Accidents involving large trucks can be serious and can result in catastrophic injuries or even death. If you are involved in a truck accident it is important that you speak with an experienced Sacramento Truck Accident Attorney to determine whether you have a claim. Hello. My name is Ed Smith. I am an experienced Sacramento Truck Accident Attorney. 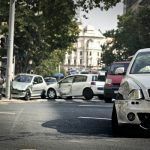 I have created the most comprehensive accident information website available, www.AutoAccident.com. If you or someone you love has been injured in a serious accident involving a commercial vehicle or large truck, please call me at (916) 921-6400. When you call, I will provide you with free, friendly advice at no obligation to you. If you are calling from outside of the Sacramento area, please call me toll-free at (800) 404-5400. Click here to read our top-notch client reviews: Yelp, Avvo, and Google. Proud member of the Million Dollar Advocate Forum.